Every generation for all of recent history has faced various forces in their work life – the speed of innovation and change, politics both internal and external, macroeconomic factors, etc. Each generation has faced different circumstances requiring different skill sets to thrive within them. But there is a single skill, or rather two separate skills packaged as one, that has a common thread throughout history. It helped people just as much in 1932 as it helps us now. The only difference is that it’s becoming much rarer (and quickly so) in today’s attention-deficient world. That skill is what I call playing the long game, and it’s broken down into continually learning and working hard over long periods of time. Being a continual learner is arguably more important now than it has ever been. With rapid change comes a need for a continual understanding of the change. It’s those that commit to personal growth, both in intelligence and skills, that stay ahead of the curve. Knowledge and information also happen to be more accessible than ever before, so any excuse to not learn is likely invalid. You can teach yourself how to code for free, get an MBA packaged in an online course or book for the price of a couple coffees, or you can take any number of free online courses from Ivy League schools. The formula is simple. Change is happening quicker than ever yet the speed and depth at which most of us learn haven’t increased. This creates a gap between the new frontier of work and the workforce that is supposed to drive it. And in that gap there’s opportunity. Hard work has historically been a commodity. It was the rule, not the exception, for most of recent history. For a number of reasons, this has changed. Hard work – the kind where you simply put your head down, absorb, learn, and adapt for years on end – has now moved from a commodity to a rarity. Get rich quick propaganda and stories of young entrepreneurs making millions of dollars in a short amount of time have created a “quick fix” mentality for much of the population, specifically the younger generations. Commitment to longevity has been replaced by quick jumps to trying this or that new thing. Much like the learning gap mentioned above, the hard work gap creates an opportunity for those paying attention to it. The person that is willing to work hard and commit to the long haul has a distinct advantage over those that will be in and out of various paths in six-month chunks. The world of work has changed. Moving forward, the people that win will be the people that understand success is a persistent (wo)man’s game. Be as persistent as you are intelligent, and you will win in the long run. Hard work combined with the curiosity to never stop learning is an unstoppable combination. In a world where it is rare, those who commit to playing the long game will be the ones that shape history. Last year I read 55 non-fiction books. That’s more than a book per week for an entire year. But what does that even mean for me as a learner? Was it information that I applied to my life? Was it information that I absorbed and can later recall? Did those 55 books stick, and somehow move the needle in my life? Some, yes. Others, no. But they all, in theory at least, held some wisdom that is worthy of remembering. Much like the people in our lives, there’s usually something to be learned from the books that cross our paths. Reading large quantities of information is important to me. In a similar vein as “hard work”, reading is insurance for staying ahead of the general population and lesser versions of myself. But just like working hard can be detrimental if that work isn’t intelligent work, reading a lot can be detrimental if that knowledge isn’t absorbed and applied. Wasted reading, just like wasted hard work, purely equates to wasted time. So there must be a balance of quantity and absorption, consumption and application. What is the distillation of this book, and how do I apply it to my life? The result is a very simple 3×5 note card process that I complete after finishing a book. I don’t take notes while I’m reading because I want to focus on the big themes – the paradigms not the details, the models not the components – which tend to reveal themselves once the book is completed. 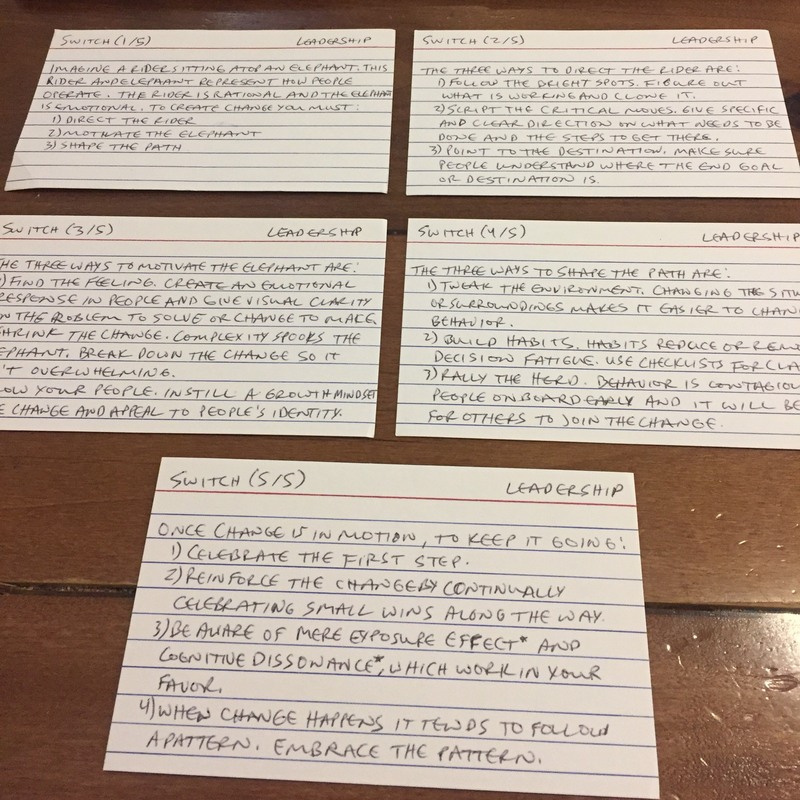 Once I’ve finished reading a book, I then go back and skim the book while doing the following to create my note card system. Quantity Each book gets (5) 3×5 note cards. No more, no less. The actionable outtakes of a book should be like an elevator pitch – short and memorable. 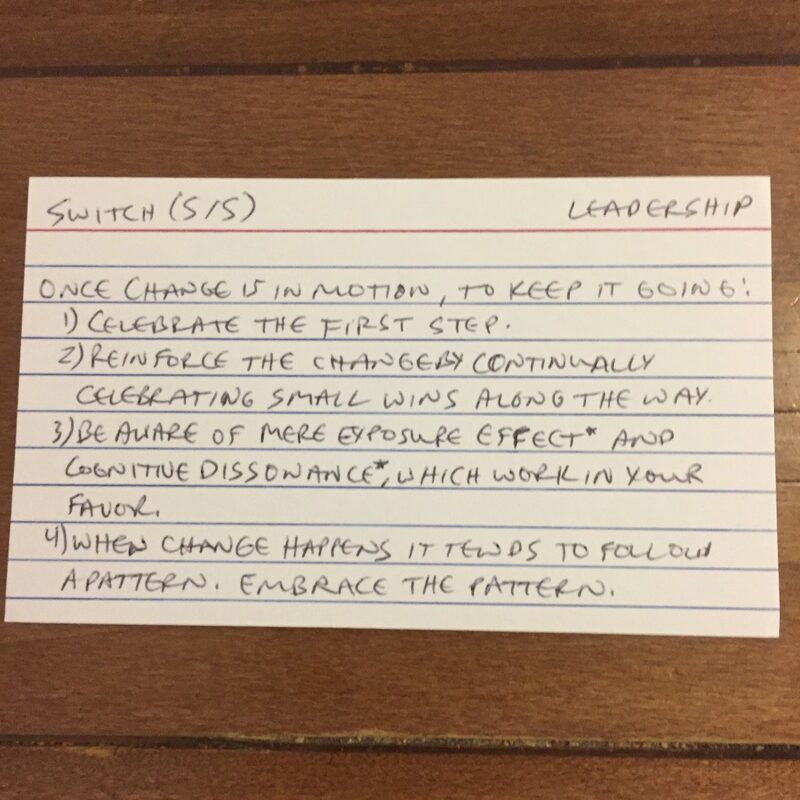 By using just 5 note cards it forces me to think through what is most valuable. Title In the upper-left of each note card, I write the title of the book. Topic In the upper-right of each note card, I write the topic or category of the book – entrepreneurship, leadership, parenting, habits, etc. Takeaway The front of each note card has a key takeaway. These are the things I want to remember and apply to my life. Research The back of each note card has concepts that I don’t fully understand, and I write them down as a reminder to read more about them. This oftentimes leads to my next book to read. Organization I then organize the note cards by topic first and title second. They go in a plastic note card holder, separated by topic. This process, over time, will give me a large warehouse of actionable information in various disciplines at my fingertips. Think about having several years worth of leadership content, distilled into actionable insights, at your disposal whenever you need. That’s my ultimate goal. I’ll have a library of information to revisit when I want to dig deeper or refresh myself on a specific topic. This process also has a secondary benefit of reminding me of the books I’ve read in the past. 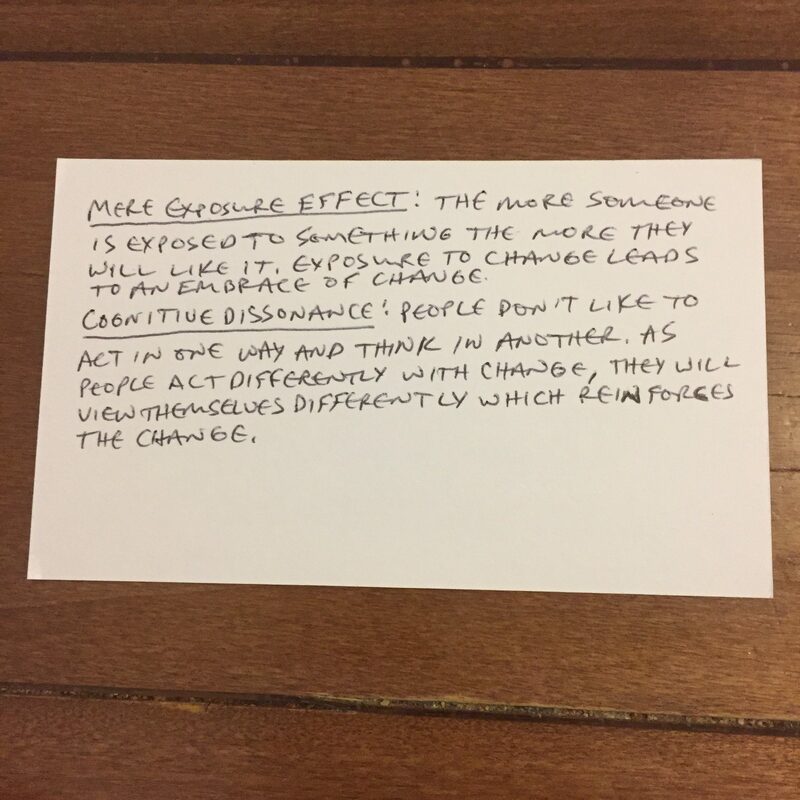 I’m regularly asked by readers about this book or that book, and by having this system in place I’ll be able to quickly reflect on whether or not a book was a good read when I pull up the relevant note cards. Information is useless if not applied. This system helps me absorb and apply information instead of just consume it. It took me many years of heavy reading to get to this point, and while it works for me it may not work for you. But wherever you’re at in your reading journey, think critically through building your own system for applying knowledge. Better to read one book and apply it than read ten books and forget them all. There’s books for it, classes for it, coaches for it, and drugs for it. And yet…we haven’t seemed to get any better at attaining it. Is it possible that we’ve taken something that should be engineered in the language of simplicity and instead attempted to engineer it in the language of complexity? I’ve been on the consumption side of the happiness publishing industry more times than I’d like to admit, and the same patterns continually emerge. When I take these countless thousands of pages of information and analyze my own life in conjunction, these patterns become crystallized. In the product development world an MVP, or Minimum Viable Product, is an early version of a product used to collect the maximum amount of learning about customers with the least effort. In effect, it’s the most attainable version of the product that becomes the starting point for its evolution. Minimum input for maximum output. When I apply this MVP line of thought with my beliefs and observations about happiness, the product becomes pretty simple. Our positive anticipation of the future gives us hope for what lay ahead. We need a reason to work hard, a reason to move forward, and by intentionally striving for something to accomplish, we add fuel to that future. This doesn’t have to be overly lofty or ambitious either. Competing in a race, bumping up a few spots in the sales numbers, starting a blog. Simple and attainable goals to strive for add purpose, and in turn happiness, to our daily lives. No, this doesn’t mean we need to be in a relationship to be happy. But it does mean we need relationships, whether romantic or not, in our lives. It’s no secret that we’re wired to be social beings, and by surrounding ourselves with people that we love we create a foundation that makes the rest of our lives operate better. It can be family, it can be a few close friends, or it can be our significant other (or ideally all three). Social relevancy feeds one of our oldest and most hard-wired desires for connection. Achievement is like an immediate and significant dose of endorphins. We love checklists because we love to check things off of the list. We love goals because it feels good to achieve them. We love small wins because they make the journey to the big win worth it. Achievement is the key to happiness in our work, which most of us spend a good chunk of our lives absorbed in. We’re better off pursuing things that we’re good at than things that we’re passionate about, because the former gives us satisfaction from achievement, while the latter doesn’t. When it comes to MVPs, the goal is to iterate based on what you learn. The same applies to this MVP of happiness. It is the starting point. We strive for goals and we iterate based on what we learn. We engage socially and we iterate based on what we learn. We achieve and celebrate and we iterate based on what we learn. The result is happiness, and that is a product we’re all sure to love. Two steps are easy. One step is hard. The first step requires effort while what follows flows from inertia. By taking the first step in any endeavor we give ourselves a disproportionate advantage for every step thereafter. The tracks have been laid and keeping the tracks going is much easier than getting them started. All too often we ponder the second, third, tenth, and hundredth steps before ever taking the first. The complexity of eating the elephant keeps us from ever taking bite number one. They all require a first step, and it is always the peskiest of the bunch. But conjure up the effort and courage required to take it and our paths fundamentally change by the shape we’re giving them. In the act of creation, the disproportionate advantage of the first step is our biggest ally, inaction our biggest enemy. Fear can be a perplexing state. It can render us powerless. It can propel us to act. It can freeze us. It can motivate us. It’s a state that we all face on a regular basis, yet it‘s also one of the most misunderstood. The roots of fear come from our innate desire to survive. We have the ability to fear because it keeps us from danger, and in turn, allows us to live for another day. This is a good thing. But when most of our days are spent running from deadlines and objectives instead of predators, the fear that stays with us is misplaced. We fear rejection. We fear failure. We fear inadequacy. In short, we fear things that aren’t worthy of our fear. Fear, in the modern context, should be a signal for us. Nothing more. It should trigger us to a moment of introspection where we can respond to the fear in the manner that is appropriate. Fear is a signal. That signal creates a moment in time. And in that moment there is the opportunity for growth. It’s on us to make the most of that opportunity.